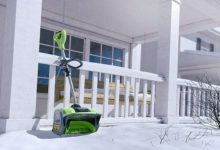 Capability – Is An Electric Snow Shovel Right For You? There are a number of different types of electric snow shovels and snow blower reviews on the market, and this one is of the electric shovel type (also know as a power shovel). It takes the form of a shovel, a sturdy plastic construction with a metal handle, and uses a 7.5amp electric motor to perform its duty. This Toro snow thrower comes with a lengthy cord for mains usage, and also has a handy cord lock for safety. 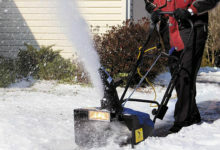 The system works by a rotor-powered auger which uses two specially designed blades to lift and throw the snow. It has a handle that is fully adjustable, so all the family can use it. 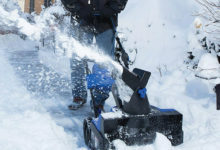 This particular model of electric snow shovel will clear a depth of 6 inches and width of 12 inches, and can remove 300lbs of snow per minute, throwing it 20feet. It may not be the largest or most powerful such machine, but it is perfectly suited for regular home use. The Toro 38361 Power Shovel is a compact electric snow shovel measuring just 15x12inches – the height may vary thanks to the adjustable handle – and it weighs just 13lbs, so is easy to handle. It also has an electric start, so you are ready to go once you are plugged in. The 7.5amp motor is sufficiently powerful to handle the clearance this model is designed for, and as it is electric, you have neither the problem with starting or that of fumes. The rotor turns with sufficient power to lift and move the snow as required, and it throws a sensible distance so clears a usable path for you. These are simple machines with one main function – to shift snow – so features are few and far between. The fact this is a corded model – as opposed to a rechargeable one – does limit its range, but an extension lead will add distance to it. You should also note the handy cord lock, which is an excellent safety feature. The blades are designed to be strong enough to last many years of quite heavy-duty usage, although the user should beware of large stones or other obstructions in its path, and while the body is plastic it is also very durable and should stand up to the usage it is intended for. As well as the adjustable handle, which can be raised or lowered by 6 inches, the grip itself can be angled to your own desired comfort, which makes the machine even easier to use. 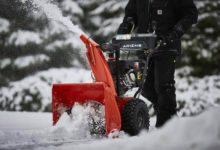 Overall, this is a basic model of a Toro snow thrower, but one that is suitably equipped to handle regular home use, is comfortable and easy to use, and will come in very handy indeed on those cold mornings. It is fair to say that there are more capable snow throwers on the market, and larger ones, but that is to overlook the intended user. 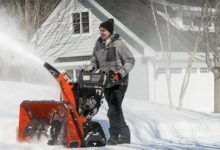 This small electric power shovel is designed for someone who needs to clear a moderate amount of snow – say a path or driveway – without much effort, and in that, it does the job it is intended for. 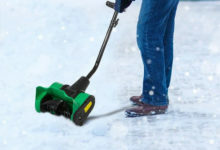 The clearance width of this electric snow shovel is 12 inches, which is quite small compared to some other models. The benefit of this is that it is easier to use, compact to store and light in weight, while the downside is a larger model would clear more snow, more quickly. The depth clearance of 6 inches is very much standard for electric snow shovels. It will be enough to clear an overnight fall of snow from your path, and with a clearance rate of 300lbs per minute, you should be able to get a sensible clear path for your car. Be aware that, unlike some more sophisticated models, this one can only throw the snow forwards. This means that to clear effectively, you should drive the snow thrower sideways across your driveway or at an angle to get the best results. For an average home, with regular average snowfall, this Toro snow thrower is a sensible choice at a very reasonable price. 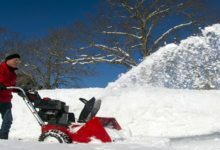 The Toro snow shovel is a compact, easy to use machine that does not cost the earth, so let’s have a quick look at the pros and cons of choosing this machine. 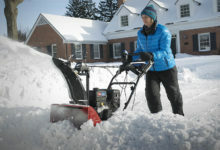 The choice of snow thrower you buy will be down not only to those factors – and others we have mentioned – but also influenced by the cost, and we should say that at around $100, this is a very sensibly-priced snow shovel from Toro which should be perfect for average household use. Is the Toro Power Shovel the model that will make your life easier on those cold, snowy winter mornings? That depends on where you live, how often you use it, and how much area you want to clear on a regular basis. Put simply, this is not a heavy-duty snow blower and should be considered as one for use only in average domestic situations. For clearing a moderate fall of snow from drives, paths, patios and gardens, the Toro 38361 will be perfectly useful. It has a decent clearance rate of 300lbs per minute and is easy to use and light to handle. In summary, it’s a very decent, affordable snow blower that will be very handy to have ready for use when the winter comes.